More and more teams are working remotely from one another.Whether it’s from home, from offices in different cities, or even in different countries, team leaders today need a robust tool for keeping their team on track. This makes collaboration crucial and having all your documents, schedules, and notes on a shared platform helps avoid chaos and confusion. Quick Base was designed from the ground up to provide just this type of work group coordination, where everything in the cloud for easy access anywhere, anytime no matter where you are located. Best of all Quick Base automates your workflows and delivers assignments right to each individual, providing clarity and accountability at the same time. Teams working from the same location, but where data and document collaboration are needed. Multiple teams working remotely but requiring access to the same documents and applications. Teams working with third party collaborators, such as vendors or clients. Enterprise teams spread out across the world who might be using a variety of different programs. Since each user has access to all their assignments and relevant information via their personal dashboard in real time, they’re able to view the progress of all projects they are a part of, update their own work progress, add notes and comments, and store valuable documents in one place. As each member of the team contributes all other team members have the most up-to-date information and document versions. This degree of real time collaboration and transparency drive LEAN process practices and intrinsically transform the productivity and accuracy of your teams. Our team of experienced Quick Base Consultants can help your business achieve these types of results quickly, driving fantastic return on investment. Our team can guide you through the process of design and development, so your teams can provide their valuable input but can also focus on doing their job, not trying to lean a new tool out of the gate. Over time we often “teach our clients to fish”, so that they can do some or all of their own development, and it does not take a degree in computer programming to do it either. A hyper flexible, “low-code” platform for rapidly building apps without any coding knowledge. Gain business intelligence. Our clients have used Quick Base to mine data more efficiently, store data securely, and analyse everything to get actionable insights. Manage overall progress of remote teams, monitor movement and bottlenecks in supply chains, manage service desks, securely store documents, and more. Project Managers and Team Leads love using Quick Base to manage and analyse daily progress and keep tabs on project KPIs. 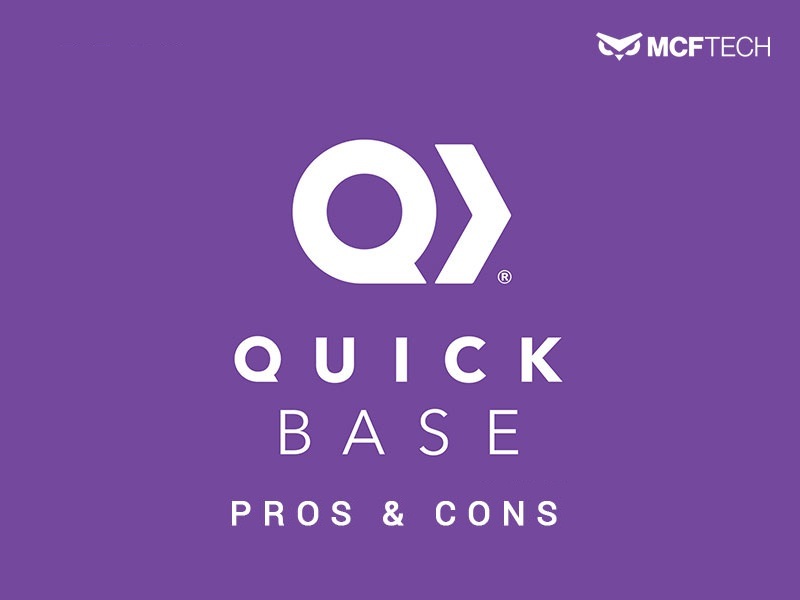 Just like everything in life, Quick Base has both pros and cons. Can be customized by an experienced Quick Base solution provider to handle almost any process within your organization. Quick Base is super flexible, so you are never “stuck” with a software version that doesn’t work they way you want to work. Quick Base has a vibrant and growing user community, sharing solutions and easily addressing any questions or stumbling blocks. Fast with no Hardware to install. All you need is a stable internet connection and you can be up and running in minutes. Quick Base is highly extensible, with a fantastic API you can connect it to other systems, do customizations, plug-ins etc. Quick Base is not made to handle super large data sets. If your process needs to manage over a million active records at any given time, then Quick Base is not the best fit alone, and may need to be integrated with a more traditional SQL or Oracle Database, which we can do. Not sure this is really a CON, but Quick Base does trade off some ability to customize the look of the apps for speed. It is not a fully brand-able website out of the box. I have almost never found this to be a problem though, as most people are very happy just to have apps that really meet their needs and actually like the simplicity of having a standard user interface for all their apps. 30 DAY FREE TRIAL. Get started in Quick Base Today. in more than twenty countries as well as systems that touch nearly every corner of the business world. Follow MCFTech on Facebook and Twitter and get amazing updates.